On Food and Cooking 0 Edition Harold McGee's On Food and Cooking is a kitchen classic. Hailed by Time magazine as "a minor masterpiece" when it first appeared in 1984, On Food and Cooking is the bible to which food lovers and professional chefs worldwide turn for an understanding of where our foods come from, what exactly they're made of, and how cooking transforms them into something new and delicious. Now, for its twentieth anniversary, Harold McGee has prepared a new, fully revised and updated edition of On Food and Cooking. He has rewritten the text almost completely, expanded it by two-thirds, and commissioned more than 100 new illustrations. As compulsively readable and engaging as ever, the new On Food and Cooking provides countless eye-opening insights into food, its preparation, and its enjoyment. On Food and Cooking pioneered the translation of technical food science into cook-friendly kitchen science and helped give birth to the inventive culinary movement known as "molecular gastronomy." Though other books have now been written about kitchen science, On Food and Cooking remains unmatched in the accuracy, clarity, and thoroughness of its explanations, and the intriguing way in which it blends science with the historical evolution of foods and cooking techniques. On Food and Cooking is an invaluable and monumental compendium of basic information about ingredients, cooking methods, and the pleasures of eating. 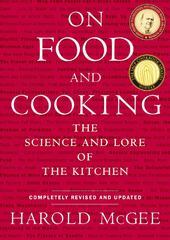 It will delight and fascinate anyone who has ever cooked, savored, or wondered about food.